For Germany, the idea of Europeanism has provided the country’s elites with the perfect alibi to conceal their hegemonic project behind the ideological veil of 'European integration'. Ελληνικά. 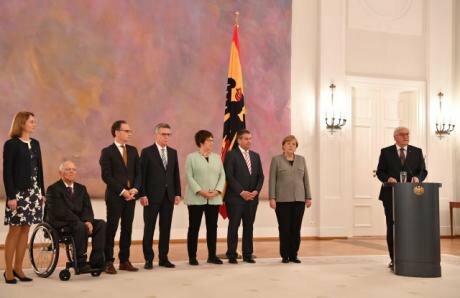 The German government prior to 24 September 2017 elections. The results of the elections were inconclusive and a new government has yet to be formed as of the publication of this article. Bernd von Jutrczenka/DPA/PA Images. All rights reserved.After Emmanuel Macron’s election in France, many (including myself) claimed that this signalled a revival of the Franco-German alliance and a renewed impetus for Europe’s process of top-down economic and political integration – a fact that was claimed by most commentators and politicians, beholden as they are to the Europeanist narrative, to be an unambiguously positive development. Among the allegedly ‘overdue’ reforms that were said to be on the table was the creation of a pseudo-‘fiscal union’ backed by a (meagre) ‘euro budget’, along with the creation of a ‘European finance minister’, the centre-points of Macron’s plans to ‘re-found the EU’ – a proposal that raises a number of very worrying issues from both political and economic standpoints, which I have discussed at length elsewhere. The integrationists’ (unwarranted) optimism, however, was short-lived. The result of the German elections, which saw the surge of two rabidly anti-integrationist parties, the right-wing FDP and extreme right AfD; the recent collapse of coalition talks between Merkel’s CDU, the FDP and the Greens, which most likely means an interim government for weeks if not months, possibly leading to new elections (which polls show would bring roughly the same result as the September election); and the growing restlessness in Germany towards the 13-year-long rule of Macron’s partner in reform Angela Merkel, means that any plans that Merkel and Macron may have sketched out behind the scenes to further integrate policies at the European level are now, almost certainly, dead in the water. Thus, even the sorry excuse for a fiscal union proposed by Macron is now off the table, according to most commentators. At this point, the German government’s most likely course in terms of European policy – the one that has the best chance of garnering cross-party support, regardless of the outcome of the coalition talks (or of new elections) – is the ‘minimalist’ approach set in stone by the country's infamous and now-former finance minister, Wolfgang Schäuble, in a ‘non-paper’ published shortly before his resignation. The main pillar of Schäuble’s proposal – a long-time obsession of his – consists in giving the European Stability Mechanism (ESM), which would go on to become a ‘European Monetary Fund’, the power to monitor (and, ideally, enforce) compliance with the Fiscal Compact. This echoes Schäuble’s previous calls for the creation of a European budget commissioner with the power to reject national budgets – a supranational fiscal enforcer. The aim is all too clear: to further erode what little sovereignty and autonomy member states have left, particularly in the area of fiscal policy, and to facilitate the imposition of neoliberal ‘structural reforms’ – flexibilisation of labour markets, reduction of collective bargaining rights, etc. – on reluctant countries. To this end, the German authorities even want to make the receipt of EU cohesion funds conditional on the implementation of such reforms, tightening the existing arrangements even further. Moreover, as noted by Simon Wren-Lewis, the political conflict of interest of having an institution lending within the eurozone would end up imposing severe austerity bias on the recovering country. Until recently, these proposals failed to materialise due, among other reasons, to France’s opposition to any further overt reductions of national sovereignty in the area of budgetary policy; Macron, however, staunchly rejects France’s traditional souverainiste stance, embracing instead what he calls ‘European sovereignty’, and thus represents the perfect ally for Germany’s plans. Another proposal that goes in the same direction is the German Council for Economic Experts’ plan to curtail banks’ sovereign bond holdings. Ostensibly aimed at ‘severing the link between banks and government’ and ‘ensuring long-term debt sustainability’, it calls for: (i) removing the exemption from risk-weighting for sovereign exposures, which essentially means that government bonds would no longer be considered a risk-free asset for banks (as they are now under Basel rules), but would be ‘weighted’ according to the ‘sovereign default risk’ of the country in question (as determined by credit rating agencies); (ii) putting a cap on the overall risk-weighted sovereign exposure of banks; and (iii) introducing an automatic ‘sovereign insolvency mechanism’ that would essentially extend to sovereigns the bail-in rule introduced for banks by the banking union, meaning that if a country requires financial assistance from the ESM, for whichever reason, it will have to lengthen its sovereign bond maturities (reducing the market value of those bonds and causing severe losses for all bondholders) and, if necessary, impose a nominal ‘haircut’ on private creditors. As noted by the German economist Peter Bofinger, the only member of the German Council of Economic Experts to vote against the sovereign bail-in plan, this would almost certainly ignite a 2012-style self-fulfilling sovereign debt crisis, as periphery countries’ bond yields would quickly rise to unsustainable levels, making it increasingly hard for governments to roll over maturing debt at reasonable prices and eventually forcing them to turn to the ESM for help, which would entail even heavier losses for their banks and an even heavier dose of austerity. It would essentially amount to a return to the pre-2012 status quo, with governments once again subject to the supposed ‘discipline’ of the markets, particularly in the context of a likely tapering of the ECB’s quantitative easing (QE) program. The aim of this proposal is the same as that of Schäuble’s ‘European Monetary Fund’: to force member states to implement permanent austerity. Of course, national sovereignty in a number of areas – most notably fiscal policy – has already been severely eroded by the complex system of new laws, rules and agreements introduced in recent years, including but not limited to the six-pack, two-pack, Fiscal Compact, European Semester and Macroeconomic Imbalances Procedure (MIP). As a result of this new post-Maastricht system of European economic governance, the European Union has effectively become a sovereign power with the authority to impose budgetary rules and structural reforms on member states outside democratic procedures and without democratic control. The EU’s embedded quasi-constitutionalism and inherent (structural) democratic deficit has thus evolved into an even more anti-democratic form of ‘authoritarian constitutionalism’ that is breaking away with elements of formal democracy as well, leading some observers to suggest that the EU ‘may easily become the postdemocratic prototype and even a pre-dictatorial governance structure against national sovereignty and democracies’. To give an example, with the launch of the European Semester, the EU’s key tool for economic policy guidance and surveillance, an area that has historically been a bastion of national sovereignty – old-age pensions – has now fallen under the purview of supranational monitoring as well. Countries are now expected to (and face sanctions if they don’t): (i) increase the retirement age and link it with life expectancy; (ii) reduce early retirement schemes, improve the employability of older workers and promote lifelong learning; (iii) support complementary private savings to enhance retirement incomes; and (iv) avoid adopting pension-related measures that undermine the long term sustainability and adequacy of public finances. This has led to the introduction in various countries of several types of automatic stabilizing mechanisms (ASMs) in pension systems, which change the policy default so that benefits or contributions adjust automatically to adverse demographic and economic conditions without direct intervention by politicians. Similar ‘automatic correction mechanisms’ in relation to fiscal policy can be found in the Fiscal Compact. The aim of all these ‘automatic mechanisms’ is clearly to put the economy on ‘autopilot’, thus removing any element of democratic discussion and/or decision-making at either the European or national level. These changes have already transformed European states into ‘semi-sovereign’ entities, at best. In this sense, the proposals currently under discussion would mark the definitive transformation of European states from semi-sovereign to de facto (and increasingly de jure) non-sovereign entities. Regardless of the lip service paid by national and European officials to the need for further reductions of national sovereignty to go hand in hand with a greater ‘democratisation’ of the euro area, the reforms currently on the table can, in fact, be considered the final stage in the thirty-year-long war on democracy and national sovereignty waged by the European elites, aimed at constraining the ability of popular-democratic powers to influence economic policy, thus enabling the imposition of neoliberal policies that would not have otherwise been politically feasible. In this sense, the European economic and monetary integration process should be viewed, to a large degree, as a class-based and inherently neoliberal project pursued by all national capitals as well as transnational (financial) capital. However, to grasp the processes of restructuring under way in Europe, we need to go beyond the simplistic capital/labour dichotomy that underlies many critical analyses of the EU and eurozone, which view EU/EMU policies as the expression of a unitary and coherent transnational (post-national) European capitalist class. The process underway can only be understood through the lens of the geopolitical-economic tensions and conflicts between leading capitalist states and regional blocs, and the conflicting interests between the different financial/industrial capital fractions located in those states, which have always characterised the European economy. In particular, it means looking at Germany’s historic struggle for economic hegemony over the European continent. "That may sound absurd given that today’s Germany is a successful democracy without a trace of national-socialism – and that no one would actually associate Merkel with Nazism. But further reflection on the word ‘Reich’, or empire, may not be entirely out of place. The term refers to a dominion, with a central power exerting control over many different peoples. According to this definition, would it be wrong to speak of a German Reich in the economic realm?" More recently, an article in Politico Europe – co-owned by the German media magnate Axel Springer AG – candidly explained why ‘Greece is de facto a German colony’. It noted how, despite Tsipras’ pleas for debt relief, the Greek leader ‘has little choice but to heed the wishes of his “colonial” masters’, i.e., the Germans. This is because public debt in the eurozone is used as a political tool – a disciplining tool – to get governments to implement socially harmful policies (and to get citizens to accept these policies by portraying them as inevitable), which explains why Germany continues to refuse to seriously consider any form of debt relief for Greece, despite the various commitments and promises to that end made in recent years: debt is the chain that keeps Greece (and other member states) from straying ‘off course’. Even though the power exercised by Europe’s ‘colonial masters’ is now openly acknowledged by the mainstream press, it is however commonplace to ascribe Germany’s dominant position as an accident of history: according to this narrative, we are in the presence of an ‘accidental empire’, one that is not the result of a general plan but that emerged almost by chance – even against Germany’s wishes – as a result of the euro’s design faults, which have allowed Germany and its satellites to pursue a neo-mercantilist strategy and thus accumulate huge current account surpluses. Now, it is certainly true that the euro’s design – strongly influenced by Germany – inevitably benefits export-led economies such as Germany over more internal demand-oriented economies, such as those of southern Europe. However, there is ample evidence to support the argument that Germany, far from having accidently stumbled upon European dominance, has been actively and consciously pursuing an expansionary and imperialist strategy in – and through – the European Union for decades. Even if we limit our analysis to Germany’s post-crisis policies (though there is much that could be said about Germany’s post-reunification policies and subsequent offshoring of production to Eastern Europe in the 1990s), it would be very naïve to view Germany’s inflexibility – on austerity, for example – as a simple case of ideological stubbornness, considering the extent to which the policies in question have benefited Germany (and to a lesser extent France). Germany (and France) have been the main beneficiaries of the sovereign bailouts of periphery countries, which essentially amounted to a covert bailout of German (and French) banks, as most of the funds were channelled back to the creditor countries’ banks, which were heavily exposed to the banks (and to a lesser degree the governments) of periphery countries. German policy, Helen Thompson wrote, overwhelmingly ‘served the interests of the German banks’. This is a telling example of how Germany’s policies (and the EU’s policies more in general), while nominally ordoliberal – i.e., based upon minimal government intervention and a strict rules-based regime – are in reality based on extensive state intervention on behalf of German capital, at both the domestic and European level. As Andy Storey notes, not only did the German government, throughout the crisis, show a blatant disregard for ordoliberalism’s non-interference of public institutions in the workings of the market, by engaging in a massive Keynesian-style programme in the aftermath of the financial crisis and pushing through bailout programmes that largely absolved German banks from their responsibility for reckless lending to Greece and other countries; German authorities have also been more than happy to go along with – or to encourage – the European institutions’ ‘exercise of unrestrained executive power and the more or less complete abandonment of strict, rules-based frameworks’ – Storey is here referring in particular to the ECB’s use of its currency-issuing monopoly to force member states to follows its precepts – ‘to maintain the profitability of German banks, German hegemony within the Eurozone, or even the survival of the Eurozone itself’. Germany (and France) are also the main beneficiaries of the ongoing process of ‘mezzogiornification’ of periphery countries – often compounded by troika-forced privatisations –, which in recent years has allowed German and French firms to take over a huge number of businesses (or stakes therewithin) in periphery countries, often at bargain prices. A well-publicised case is that of the 14 Greek regional airports taken over by the German airport operator Fraport. France’s corporate offensive in Italy is another good example: in the last five years, French companies have engaged in 177 Italian takeovers, for a total value of $41.8 billion, six times Italy’s purchases in France over the same period. This is leading to an increased ‘centralisation’ of European capital, characterised by a gradual concentration of capital and production in Germany and other core countries – in the logistical and distribution sectors, for example – and more in general to an increasingly imbalanced relationship between the stronger and weaker countries of the union. These transformations cannot simply be described as processes without a subject: while there are undoubtedly structural reasons involved – countries with better developed economies of scale, such as Germany and France, were bound to benefit more than others from the reduction in tariffs and barriers associated with the introduction of the single currency – we also have to acknowledge that there are loci of economic-politic power that are actively driving and shaping these imperialist processes, which must be viewed through the lens of the unresolved inter-capitalist struggle between core-based and periphery-based capital. From this perspective, the dichotomy that is often raised in European public discourse between nationalism and Europeanism is deeply flawed. The two, in fact, often go hand in hand. In Germany’s case, for example, Europeanism has provided the country’s elites with the perfect alibi to conceal their hegemonic project behind the ideological veil of ‘European integration’. Ironically, the European Union – allegedly created as an antidote to the vicious nationalisms of the twentieth century – has been the tool through which Germany has been able to achieve the ‘new European order’ that Nazi ideologues had theorised in the 1930s and early 1940s. In short, the European Union should indeed be viewed a transnational capitalist project, but one that is subordinated to a clear state-centred hierarchy of power, with Germany in the dominant position. In this sense, the national elites in periphery countries that have supported Germany’s hegemonic project (and continue to do so, first and foremost through their support to European integration) can thus be likened to the comprador bourgeoisie of the old colonial system – sections of a country’s elite and middle class allied with foreign interests in exchange for a subordinated role within the dominant hierarchy of power. From this point of view, the likely revival of the Franco-German bloc is a very worrying development, since it heralds a consolidation of the German-led European imperialist bloc – and a further ‘Germanification’ of the continent. This development cannot be understood independently of the momentous shifts that are taking place in global political economy – namely the organic crisis of neoliberal globalisation, which is leading to increased tensions between the various fractions of international capital, most notably between the US and Germany. Trump’s repeated criticisms of Germany’s beggar-thy-neighbour mercantilist policies should be understood in this light. The same goes for Angela Merkel’s recent call – much celebrated by the mainstream press – for a stronger Europe to counter Trump’s unilateralism. Merkel’s aim is not, of course, that of making ‘Europe’ stronger, but rather of strengthening Germany’s dominant position vis-à-vis the other world powers (the US but also China) through the consolidation of Germany’s control of the European continental economy, in the context of an intensification of global inter-capitalist competition. This has now become an imperative for Germany, especially since Trump has dared to openly challenge the self-justifying ideology which sustains Germany’s mercantilism – a particular form of economic nationalism that Hans Kundnani has dubbed ‘Exportnationalismus’, founded upon the belief that Germany’s massive trade surplus is uniquely the result of Germany’s manufacturing excellence (Modell Deutschland) rather than, in fact, the result of unfair trade practices. This is why, if Germany wants to maintain its hegemonic position on the continent, it must break with the US and tighten the bolts of the European workhouse. To this end, it needs to seize control of the most coveted institution of them all – the ECB –, which hitherto has never been under direct German control (though the Bundesbank exercises considerable influence over it, as is well known). Indeed, many commentators openly acknowledge that Merkel now has her eyes on the ECB’s presidency. This would effectively put Germany directly at the helm of European economic policy. Even more worryingly, Germany is not simply aiming at expanding its economic control over the European continent; it is also taking steps for greater European military ‘cooperation’ – under the German aegis, of course. As a recent article in Foreign Policy revealed, ‘Germany is quietly building a European army under its command’. This year Germany and two of its European allies, the Czech Republic and Romania, announced the integration of their armed forces, under the control of the Bundeswehr. In doing so, the will follow in the footsteps of two Dutch brigades, one of which has already joined the Bundeswehr’s Rapid Response Forces Division and another that has been integrated into the Bundeswehr’s 1st Armored Division. In other words, Germany already effectively controls the armies of four countries. And the initiative, Foreign Policy notes, ‘is likely to grow’. This is not surprising: if Germany (‘the EU’) wants to become truly autonomous from the US, it needs to acquire military sovereignty, which it currently lacks. Europe is thus at a crossroads: the choice that left-wing and popular forces, and periphery countries more generally, face is between (a) accepting Europe’s transition to a fully post-democratic, hyper-competitive, German-led continental system, in which member states (except for those at the helm of the project) will be deprived of all sovereignty and autonomy, in exchange for a formal democratic façade at the supranational level, and its workers subject to ever-growing levels of exploitation; or (b) regaining national sovereignty and autonomy at the national level, with all the short-term risks that such a strategy entails, as the only way to restore democracy, popular sovereignty and socioeconomic dignity. In short, the choice is between European post-democracy or post-European democracy. There is no third way. Especially in view of the growing tensions between Germany, the US and China, periphery countries should ask themselves if they want to be simple pawns in this ‘New Great Game’ or if they want to take their destinies into their own hands. Some portions of this article previously appeared in this article published by Green European Journal. Thomas Fazi is the co-author (with William Mitchell) of Reclaiming the State: A Progressive Vision of Sovereignty for a Post-Neoliberal World (Pluto, 2017).